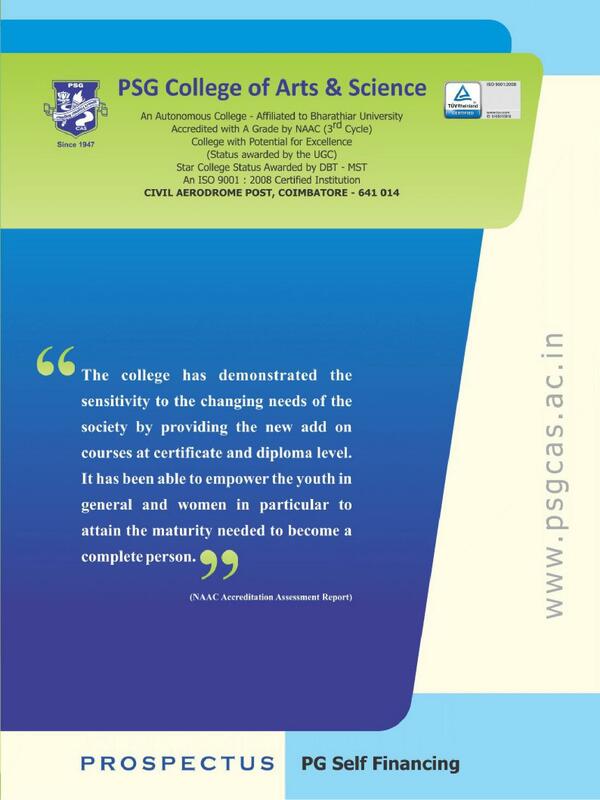 PSG College of Arts and Science was founded in 1947 in Coimbatore. This college is made with the vision of being student-oriented and focuses on the overall development of the students including both physical and mental wellness. Later on this college became one of the best colleges as an emerging premier institution of higher education in our country. The establishment of this college was done by PSG & Son's charities which are continuously in service from 1926. PSG & Son's charities consist of around 30 institutions ranging from schools, colleges, hospitals and many more. Experience gathered from these institutions make this organization a pioneer in the field of education. PSG College of Arts and Science was later on recognized by University Grants Commission (UGC) in October 2004. Being the only college affiliated to Bharathiar University makes it unique. This college scored five stars followed by A+ and A Grade by NAAC from last three cycles. 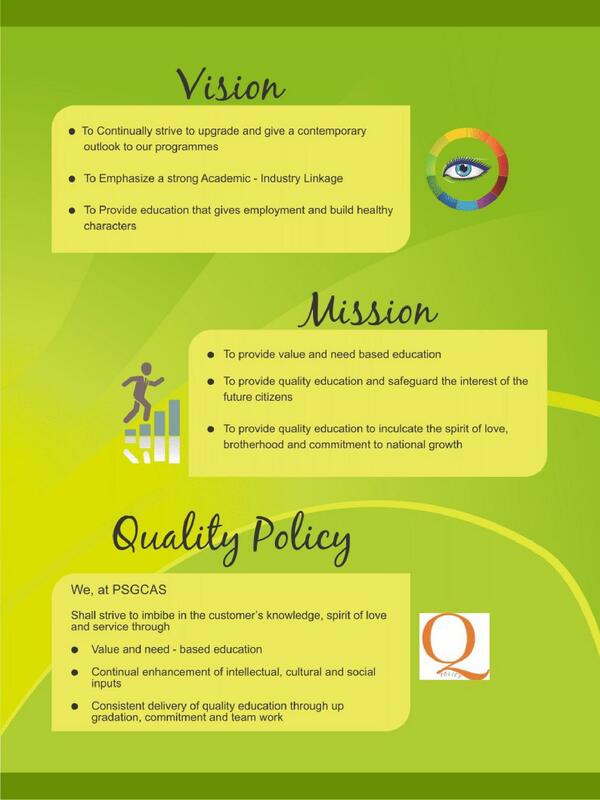 PSG College of Arts and Science is currently ISO 9001:2008 certified institution. Passing class 12 board exams with subjects respected to the course. Bachelor’s degree in respective courses. Management present at the PSG College of Arts and Science provides numerous scholarship programs. Some of the scholarship programs are listed below. SC/ST scholarship – Govt of India Income limit Rs. 1,00,000/– per year. Free education to the first generation students belonging to backward classes up to UG Degree. Income limit below Rs. 50,000/– per year. Free education for undergraduate girl students belonging to poor and middle class families. Foundation for Academic Excellence and Access (FAEA) Scholarship. 2016 & 2018 – Nationally Ranked by 11th by NIRF. 2013 – DBT awarded star department status to Basic Science Departments. 2010 – ISO 9001:2008 Certified Institution Food Processing Centre by MFPI. 2006 – Gurukul Jyothi Award for excellence in education. College management is strict about many things but only considering the welfare and well being of the students. They always give importance to the wish of the students and supports all endeavors. However, if the students misbehave or cause any trouble, strict actions will be taken against them. They are taking students caste wise such ad bc sc st mbc on, they take on students number students and sc st student low, so this is one of the drawbacks in our college. Our college is an autonomous college, everything in our college will be good. We have a good management. We can really enjoy our life at this campus. We have to concentrate on our studies on our own to get benefitted. Does this college offer bba in retail management? Hi Dwarka, Yes this college offers this course. Can a computer science student join BBA course in PSGCAS? Hi Surya, Yes you can apply for the course. Hi Swetha, the eligibility for MA in English is Candidate should have passed Baster’s degree in the relevant stream from a recognized university or Equivalent. I have to take admission in BSc Second Year. 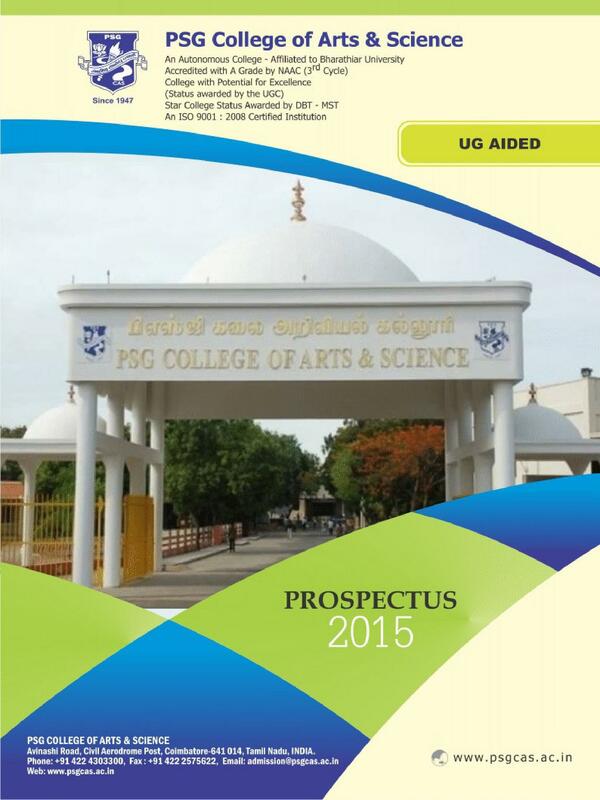 Hi Kamlesh, To get admission details regarding B.sc please contact 0422-4303300. Hi Sreedhar, Please check this link for getting the information about Fee structure for B.Com Course through this link and for more information about Hostel You may please contact to the college office no. Cutoff for this year in B.Com ? Candidate should have passed Baster’s degree in the relevant stream from a recognized university or Equivalent. How do i get application form in this collage for Msc And also for MCA? Also i want to know admission date. Hi Siva, If you want to know about admission procedure for M.Sc and MCA Course, please check this link for Admission Process of this college. 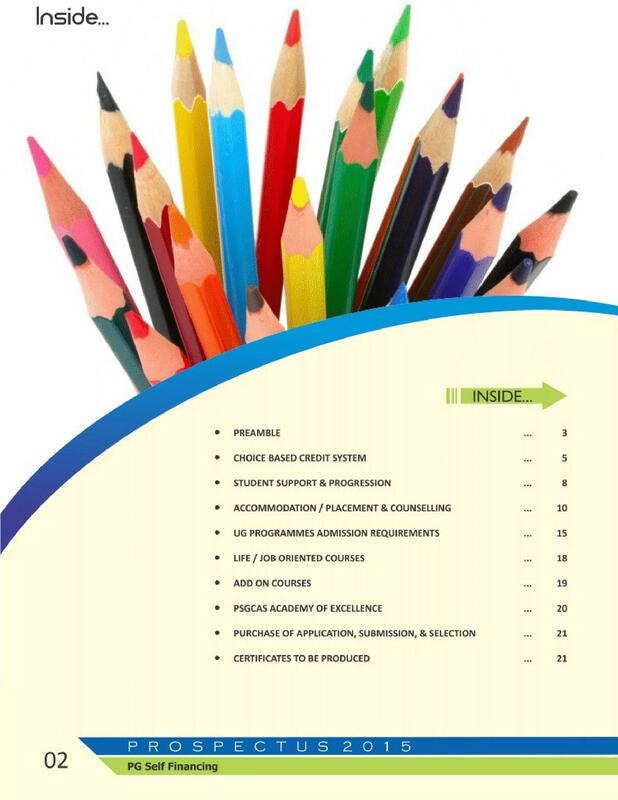 Hi Vanitha, To get information about the admission procedure, please contact on this no: 0422-4303300. This is one of the biggest colleges in India. The college has its very good name all over the world. The very old college in Coimbatore established in the year 1947. The college is located near Coimbatore international airport. It was a wast surrounding about 1km. It is due to the brand name PSG. I am not at all interested in joining engineering as my brother is an engineer. My parents also dislike myself to be enrolled as an engineering student. So, I opt-in pursuing degree courses. My home is at Pollachi. So I opted for PSG which is located at Coimbatore 40 km away from my home. "College where i going to gain full knowledge and probability on trading." The seats to get enter into this college is so difficult, the students get enter by their merit list only and the students with management seats also available, the students can enter basis of their 10 th and 12th marks.